From Monday 18th September the Mahinapua Track will be closed at the Mananui Sawmill site. Cyclists will not be able to access the track from SH6. From the Woodstock Road cyclists can enter but will need to turn around at the wetlands. Signage and maps are being put up at the kiosk, Mahinapua DOC Carpark on SH6 and Paiere Road directing cyclists down SH6. It is expected the track will be closed until 31 October. 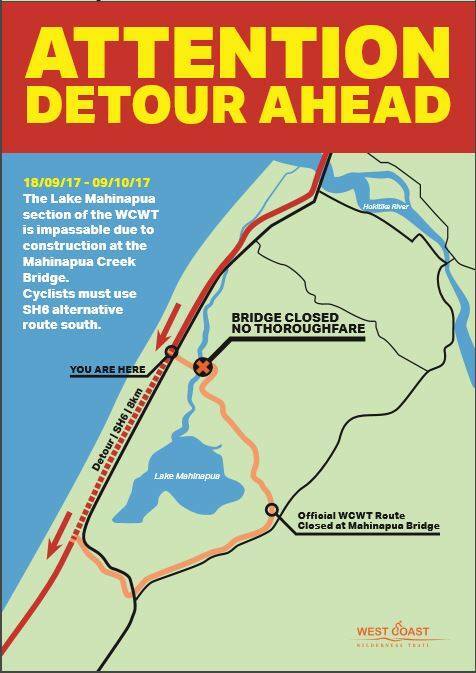 From Monday 18th September the Mahinapua Track will be closed at the Mananui Sawmill site.